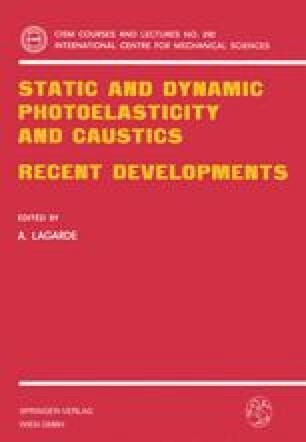 Since research in the field of dynamic photoelasticity was initiated by Tuzi(1) in 1928, there has been a continuous development of new and improved high-speed photographic systems. With the development of new higher speed films, more intense light sources, ingenious camera designs, and reliable electronic circuitry, continuous improvement has been made in the quality of the photographs of dynamic events with objects or images propagating at high velocity. Three different photographic systems have been specially adapted for application involving dynamic photomechanics which provide whole field representation of the data. All three of these systems may be considered adequate for photographing high-density fringe patterns propagating at velocities as high as 100,000 in/sec (2540 m/sec), but each system exhibits advantages and disadvantages.